[AUTO](VC) Limit Break 4 (This ability is active if you have four or more damage):[Counter Blast (2) & Choose two «Spike Brothers» from your hand, and put them into your soul] When this unit attacks a vanguard, you may pay the cost. If you do, search your deck for up to two «Spike Brothers», call them to separate open (RC), and shuffle your deck. [AUTO](VC):When this unit is boosted by a «Spike Brothers», this unit gets [Power]+3000 until end of that battle. 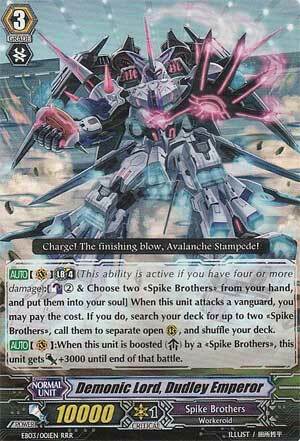 [AUTO](VC) Limit Break 4 (This ability is active if you have four or more damage):[Counter Blast (2) & Choose two «Spike Brothers» from your hand, and put them into your soul] When this unit attacks a vanguard, you may pay the cost. If you do, search your deck for up to two «Spike Brothers», call them to separate open (RC), and shuffle your deck. [AUTO](VC):When this unit is boosted by a «Spike Brothers», this unit gets [Power]+3000 until end of that battle. The king of Spike Brothers...and for good reason! This is, debatably, the best Spike Brothers card in the game just because of the limitless potential that this card unlocks for your deck! Need that extra push to get that final damage? Call 2 Juggernaut Maximums from your deck to have two more heavy hitting attacks go in! Have only Grade 3's and need a better defense setup? Call a pair of Panzer Gales for some Special Intercepts! The only downside with this is that it'll cost you two cards in your hand, but these cards go into your Soul for food for the rear-guard powerhouses. To make things better, when Dudley Emperor is boosted by a Spike Brother, then he gains an extra 3,000 power which makes his overall potential attack power 21,000 (when boosted by Wonder Boy) which makes it so that anything that's 11,000 or weaker have to guard with 15,000 worth of shield and hope that no triggers are revealed. Speaking of weak Vanguards, however, I do believe that being at 10,000 power makes him all the more vulnerable by the Loyalty Columns and any other columns that can attack with a combined power of 20,000 or higher, and in this clan, where you have a super high offense and an extremely low defense, that can cost you the game. The Duddles, Big D, Dudley-kins. This guy made Spike Brothers the competitive force they are today. Replacing the inconsistent General Seifried as the primary vanguard, Duddles has a high cost, high return limit break that can often end games in one turn. Counterblast two and soul charge two cards from your hand, and you can call out any two Spike Brothers units from your deck. You do this as Duddles is attacking, but before the opponent guards the attack, so anything you call is called “during the battle phase”, which is a trigger condition for a few powerhouses that you could potentially be calling. This skill is not grade restrictive, either, so calling out two Juggernaut Maximum is fair game, and the two cards you just put in the soul will ensure that the Juggernauts can attack at full strength. Coupled with his second skill (plus 3k power when boosted by a Spike Brothers), a Duddles limit break can easily overwhelm an ill-prepared opponent and inflict a ridiculous amount of damage, and if it doesn’t, you can just as easily do it again next turn. One must be careful when piloting a Dudley themed Spike Brothers deck, though. The steep cost can often leave you without a good sized hand, making you vulnerable should your limit break play fail. A greatly conservative early game and some future planning is essential to a Spike Brothers player. You’ll want to fill up your soul, and have your front rear guard positions open by the time you limit break, all the while maintaining a hand. Just because you can call any grade Spike Brothers doesn’t necessarily mean you should always grab two Juggernauts. If you know your opponent is able to make a counter swing next turn, you have some other, more defensive options available. Panzer Gale comes to mind, for defence, as does Fierce Leader, Zachary, for hand replenishment. Dudley is a versatile powerhouse for the Spike Brothers deck, trading two cards in hand for whatever you need at that moment. Rating: 5/5 – Singlehandedly optimized the Crush Rush attack pattern.